Four generations of Fergus children have learned to swim at The Beatty Pool. The Beatty Pool in Fergus has been the recreational heart of the community for 75 years. It is still located across the street from the Beatty Brothers Ltd. factory, which was influential in the development of Fergus as early as 1874. Owners George and Matthew Beatty began manufacturing farm equipment at the factory, and were leading employers in the community. When a drowning occurred in the local Grand River, the Beatty family supported the construction of a community pool, built by their employees, as a safer alternative. 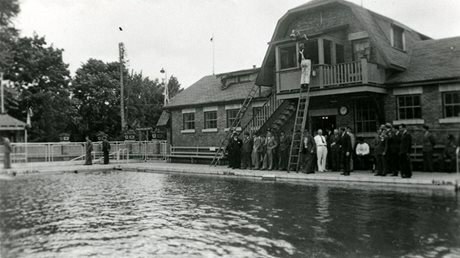 Its doors opened on July 7, 1930 and provided generations of Fergus residents with a place to swim and develop their skills. Steam from the Beatty factory heated the pool during the winter months. The pool was designated under the Ontario Heritage Act in 2006 by the Township of Centre Wellington to preserve the community landmark for future generations. Learn more about the heritage-designated building on the Canada’s Historic Places website. Read more about Beatty Brothers Ltd. from an article on the Western University website.